In this 5-Day Hands-On Equine Therapies Course, students are taught the IET Method Melding with Equus® techniques. Melding is the connection we make with the horse on a deeper physical, emotional, and energetic level. 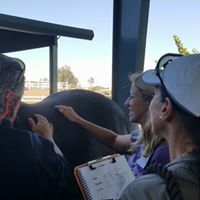 Students attending this course will learn this and other advanced techniques that will allow the student to connect with the horse at a deeper level that allows for better training, a better relationship, and better riding. This 5-Day Intensive Hands-on Course is limited to 6 students – or up to 10 with one on one hands on help from Teaching Assistants, allowing for abundant one-on-one time and guidance, feedback, encouragement and mentoring. If you are on the fast track for certification in the IET Method Foundation Courses, this is the course for you. This Course is a perfect way to accelerate your awareness, skills, and abilities with horses. This course combines all three (3) of the IET Method Foundation Techniques Hands-on Courses into one full week of 5-Days Hands On Teaching and Learning. Ask us about a payment plan. *Minimal business fee will apply. Students interested in becoming certified in the Integrated Equine Therapies will need to complete this clinic and enroll in the Certification Program. This clinic is suitable for veterinarians and all equine professionals. Techniques taught in this clinic will increase your skill set and enhance your effectiveness. All the techniques taught in each of the Foundational Hands-on clinics will be taught throughout the week. There is a “No Cancellation” Policy for this course. Students enrolled in a Virtual Learning Study Group will have ample opportunities to ask questions, get answers, and participate in a discussion on the different techniques they learned during a clinic or course. Students participating in a Virtual Learning Study Group have found their knowledge and understanding of Integrated Equine Therapies techniques and methods have increased dramatically. Individuals interested in becoming certified in Integrated Equine Therapies are strongly encouraged to enroll in at least one study group. These groups are limited to 10 students, allowing everyone the opportunity to get their questions answered. Each study group last approximately 90 minutes and requires Skype to be installed on your computer. * Virtual Learning Study Group option can be added to your order when paying for this course.